Cefixime (as T.H.) 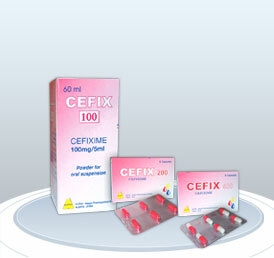 200 mg / 400 mg.
6 Capsules 200 mg / 400 mg.
Cefix (cefixime) is a semisynthetic, cephalosporin antibiotic for oral administration. Uncomplicated urinary tract infections: caused by Escherichia coli and proteus mirabilis. Otitis media: Caused by Haemophilus influenzae (beta-lactamase positive and negative strains), Moraxella (Branhamella) catarrhalis (most of which are beta-lactamase positive) and Streptococcus pyogenes. Pharyngitis and tonsillitis: Caused by S. pyogenes. Cefix is generally effective in the eradication of S. pyogenes from the nasopharynx. Acute bronchitis and acute exacerbations of chronic bronchitis: Caused by S. pneumoniae and H. influenzae (beta-lactamase positive and negative strains). Uncomplicated gonorrhea (cervical/urethral): Caused by Neisseria gonorrhoeae (penicillinase- and non–penicillinase-producing strains). Aleppo Pharmaceutical Company (ALPHA) is Syria's leading manufacturer and distributor of pharmaceutical products. Providing high quality products according to GMP requirements; regulations and ISO 9002 (Quality Management System). Syrian Pharmaceutical Industries, Middle East, Syria Pharmaceutical Industry, pharmacy, Medicaments, medical, Drugs, arab pharmaceutical manufacturing, pharmaceutical companies, pharmaceutical sales. If you have any questions about Cefix that have not been answered on this site send us an email or call ALPHA Pharmaceutical Industry at + 963-21-2122424.